Sugarfree, healthy and delicious, everything you ever wanted in a laddu is brought together by Avarya in these Sugarless Amla Oats Laddu. Apart from being a delightful treat to your sweet tooth, these laddus offer tremendous nutritional benefits. It helps in increasing your metabolism, boosting immunity and regulating the cholesterol levels in your body. 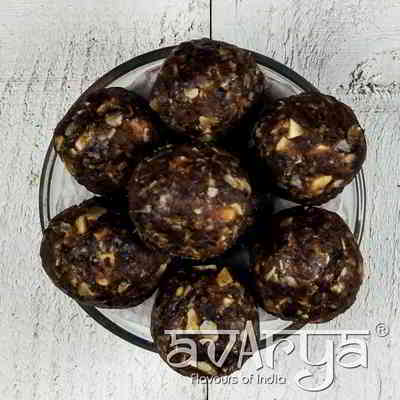 Sugarless Amla Oats Laddu	HF-MT-1209 Sugarfree, healthy and delicious, everything you ever wanted in a laddu is brought together by Avarya in these Sugarless Amla Oats Laddu. Apart from being a delightful treat to your sweet tooth, these laddus offer tremendous nutritional benefits. It helps in increasing your metabolism, boosting immunity and regulating the cholesterol levels in your body. The shelf life of Sugarless Amla Oats Laddu is 45 days. Savor the cranberry delights with Avarya's sugar free cranberry mithai. Garnished with cashew nuts, you will find that these sweets are nothing but the best. The sweet, dulcet apricots won't add to the inches of your waistline. Avarya's line of sugar free apricot mithai is delicious and make for a suitable gift for your loved ones. Enjoy mithai like never before. 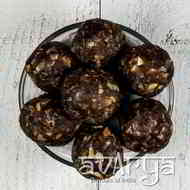 Avarya's sugar free anjir pak has the goodness of almonds and pistas that converge to form a sinful delight.